Happy Tuesday Beautiful People! I’m so excited to share this post with you and actually the next few posts coming up because, I’m shopping my closet for all the looks. The only purchases were either a top or pair of shoes. For today’s look, the only new item is the sweater. 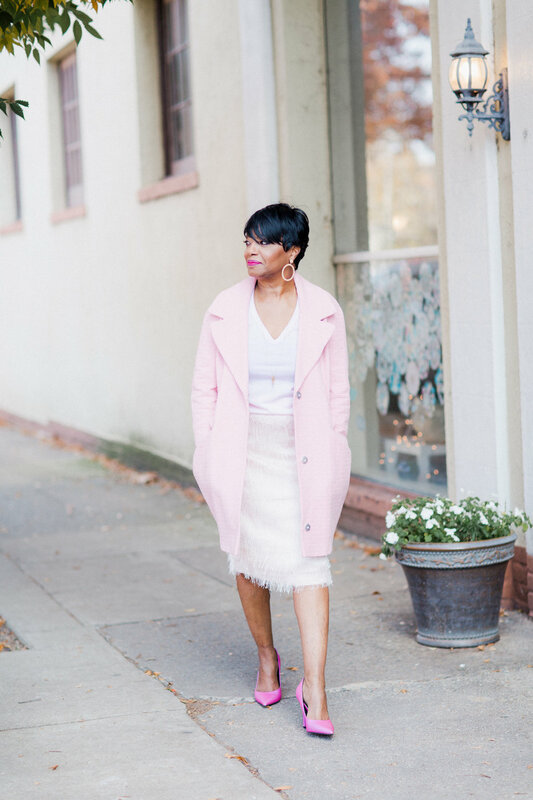 The eyelash skirt and shoes are from last season and I’ve had the pink coat for about four years. 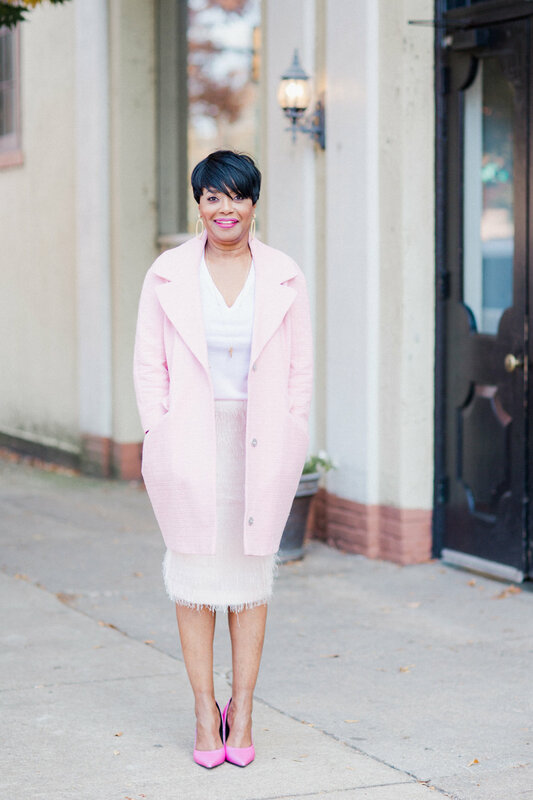 So, I’m showing you how I styled this all pink monochromatic look and I hope you love it…it’s one of my favorites…”Pretty in Pink”! Monochromatic - to wear an outfit with one color that has different textures and similar shades of the one color. I shopped for the sweater at one of my favorite stores, Banana Republic…there were so many beautiful sweaters to choose from but for my look, I selected the merino wool v-neck sweater in blush pink….I love the feel of the material against my skin and I also love the v-neck style. The eyelash skirt is also from BR…I purchased it last year…you can see me wearing it here in a previous post…..now for my favorite pink coat, I purchased about four years ago from ASOS…of course they no longer have this one but they do have a quite a few chic coats to choose from…I love the vintage look and feel to this coat…I also love this pink coat….and this one! 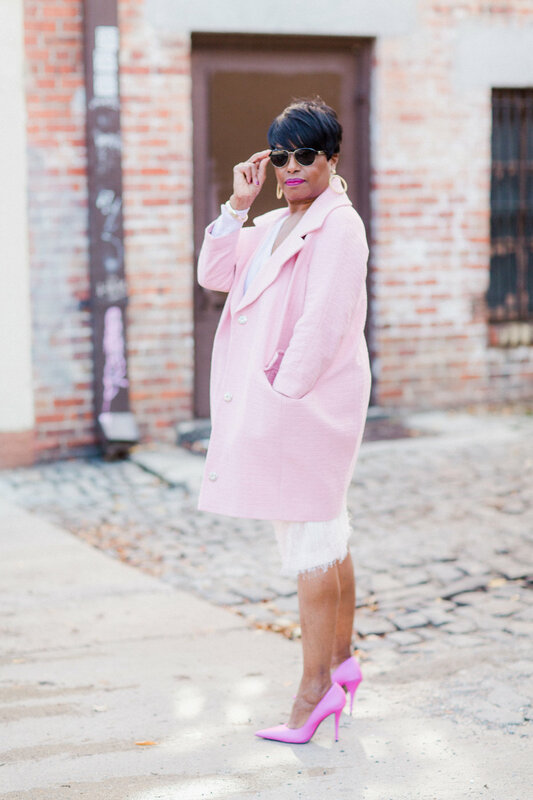 And you remember the pink shoes from Zara…check them out on this post…I got them in January….I also love these pink shoes…and how cute are these…and these hot pink shoes by Steve Madden are another favorite…so many options y’all! When choosing the color for your monochromatic look, make sure the color looks great against your skin tone. Also, make sure you mix in textures when choosing your look…you don’t want your look to be boring to the eye and the texture can also be in the shoe selection….make sure to add balance to your outfit…don’t get carried away with the color. 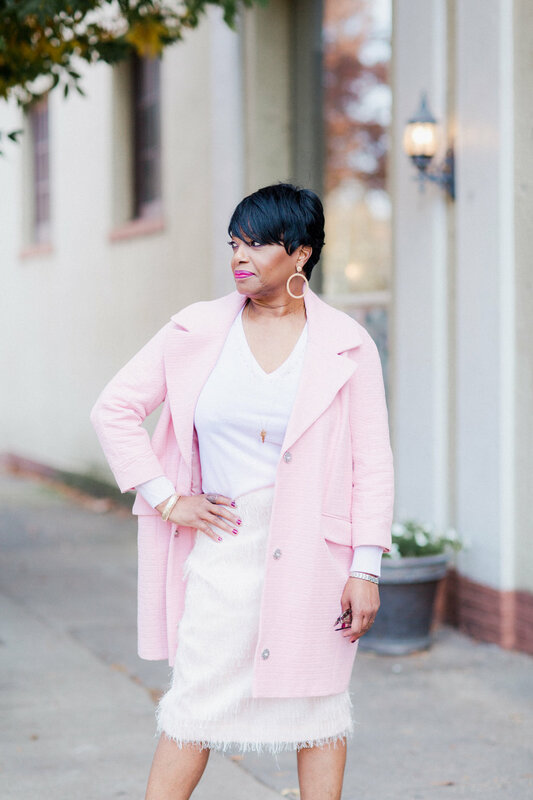 As for my accessories, I kept it simple with my gold hoops from J.Crew and my gold necklace from The Giving Keys and I’m wearing my mom’s gold bracelet…..Erika used Flat Out Fabulous by MAC on the lips…such a pretty shade of pink and I love a matte lipstick! I have to share with you that while Ali was shooting this look, I was crossing over from the cobble stone to the sidewalk and there was a car coming from the alley way….I stopped for the car to pass and the young lady inside the car put her window down and said that she follows me on Instagram…I was so humbled and so surprised by her…how sweet of her and I just want to say, if you are reading this, I just want to thank you again…so sweet of you. I told the ladies, that was my “Oprah” moment.